Background: Adequate seal of the root canal is necessary to prevent recontamination and ensure the long-term clinical success. The aim of this study was to evaluate the sealing ability of ProRoot mineral trioxide aggregate (MTA), Biodentine, and Ortho MTA as the root canal obturation materials using the fluid infiltration method. 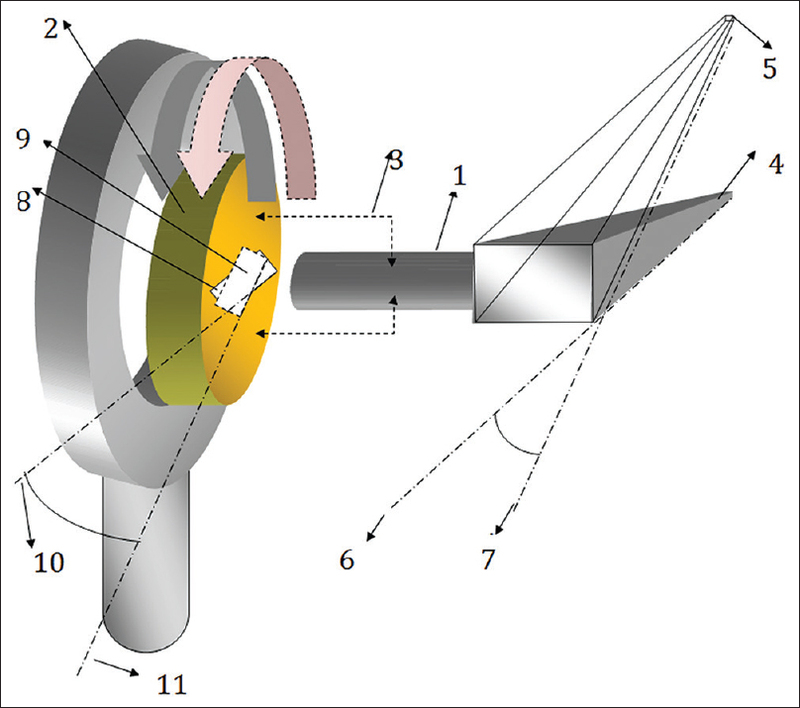 Materials and Methods: In this invitro study a total of 66 extracted human mandibular premolars were randomly divided into five groups according to the material used for the root canal obturation. Group I - ProRoot MTA (20 samples), Group II - Biodentine (20 samples), Group III - Ortho MTA (20 samples), Group IV - negative group (3 samples), and Group V-positive group (3 samples). MTA, Biodentine, and Ortho MTA were applied using a cotton-tipped K-file #30 and hand plugger into the root canals of each group. In Group 4 (negative control), no filling material was used. In Group 5 (positive control), a single gutta-percha size #40 was inserted into the root canal without using a sealer. The teeth were mounted and exposed to the fluid infiltrarion system. Statistical analysis was performed using Kruskal–Wallis test the level of significance was set at α = 0.05. Results: Mean values of microleakage in MTA ProRoot, Biodentine and Ortho MTA groups were 1.83 ± 0.62, 1.95 ± 1.27 and 1.72 ± 0.83 μL in 8 minutes. No statistically significant difference was observed between the sealing ability of ProRoot MTA, Biodentine, and Ortho MTA (P = 0.091). Conclusion: Within the limitations of this study, microleakage values were similar to MTA ProRoot, Biodentine, and Ortho MTA using the fluid infiltration technique. Background: Setting of condylar inclination is inaccurate in nonarcon articulators because of alteration of the angle between the upper member and condylar track. This article presents a device which can be attached to a nonarcon articulator to rectify errors related to alterations of maxillary occlusal plane-horizontal condylar guidance relation in nonarcon articulators. Materials and Methods: The device provides tight connection of condylar axis to condylar track by mechanical interdigitation of fragments which are placed on condylar axis and condylar track. Condylar track rotates coordinated with condylar axis. Fragments consist of medial fragments placed on medial surface of articular fossa analogs, lateral fragments placed on lateral surface of articular fossa analogs, and condylar axis fragments placed on condylar axis. The device can be used during condylar inclination adjustment by interocclusal records, changing vertical dimension of occlusion, and occlusal adjustment of restorations. Initial evaluation of the device was performed during an opening hinge movement in a single experiment. The angle between condylar track and the upper member of the articulator was determined by calculation before and after applying hinge movement and with and without the device. Results: When the device was not used, the postexperimental condylar inclination was 7.31° higher than preexperimental value. Using the device, discrepancy reached 2.17°. Conclusion: Using this device may lead to more accurate condylar inclination adjustment which is followed by more accurate prosthetic teeth. Background: Evidence on the protecting effect of laser on bleached enamel is scarce and controversial. Therefore, we aimed to test for the first time whether different wavelengths of diode laser (810 and 980 nm) can prevent enamel surface corrosion. We also tested for the first time whether such therapeutic effects of laser are limited to specific “laser-activated” bleaching gels or both conventional and laser-activated gels. Materials and Methods: In this qualitative experimental study, ten intact human teeth were randomly assigned to five Groups. They were sectioned into twenty buccal/lingual pieces. The groups were: (1) laser-activated gel + 810 nm laser, (2) laser-activated gel + 980 nm laser, (3) conventional gel + 810 nm laser, (4) conventional gel + 980 nm laser, (5) conventional gel only, and (6) laser-activated gel - no irradiation. Buccal sections in each group were subjected to bleaching (according to the stated protocols), and later subjected to field-emission scanning electron microscopy (SEM) and X-ray diffraction (XRD). The lingual pieces were used as “before-treatment” negative controls for XRD. Results: XRD showed an increase in the mineral phase and crystallinity of the enamel in all bleaching groups. This was stronger in the laser-irradiated groups with conventional bleaching agent. 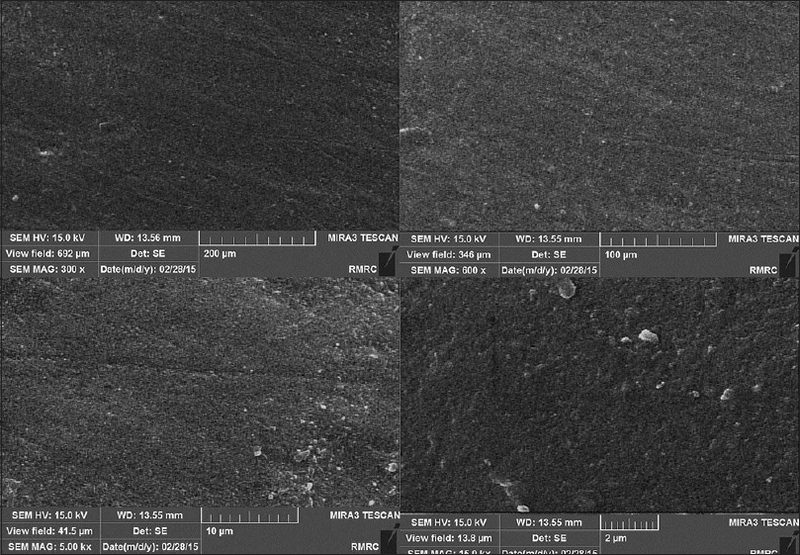 SEM showed a complete etched surface in the positive control groups (i.e., bleached using conventional agent). However, all four laser groups had almost intact surfaces. Conclusion: This study showed the positive effect of diode laser irradiation at 810 nm or 980 nm wavelengths on the prevention of bleaching damage, irrespective of the activation mechanism of the bleaching gel in use. Background: Yogic stretching (asana) has been proven to have an effect on salivary human beta-defensin-2 (HBD-2) concentration, which is an antimicrobial peptide and is an inflammatory marker in periodontal disease. Sudarshan Kriya Pranayama (SKP) is a part of yoga which involves rhythmic breathing. Hence, we aim to evaluate the periodontal parameters and to estimate the salivary HBD-2 level before and after SKP program in periodontitis individuals. Materials and Methods: An interventional study was designed and individuals were divided into three groups: Group I – healthy periodontium, Group II – chronic gingivitis, and Group III – chronic periodontitis. SKP was the interventional tool. The clinical parameters such as plaque index (PI), gingival index (GI), probing pocket depth (PPD), clinical attachment level (CAL), and salivary HBD-2 level were analyzed at baseline and 90 days after the SKP practice. Enzyme-linked immunosorbent assay (ELISA) was used to evaluate salivary HBD-2. McNemar's Chi-square, Paired samples t-test, and one-way ANOVA were used to analyze the results. P < 0.05 was considered statistically significant. Results: Following the SKP intervention, the clinical parameters such as PI and GI improved significantly in all the groups (P < 0.001); however, Group III showed a significant reduction as compared to the other groups. The mean baseline salivary HBD-2 levels of Group I, Group II, and Group III were 91.78 ng/μl, 110.22 ng/μl, and 157.63 ng/μl which was further decreased to 95.22 ng/μl, 98.22 ng/μl, and 132.88 ng/μl, respectively, following SKP intervention (P < 0.001). However, Group III had a higher HBD-2 level at 90th day as compared to other groups. Conclusion: There was an improvement in PI and GI with a decrease in salivary HBD-2 in chronic periodontitis patients following SKP. Hence, SKP can be considered as an adjunct to treatment modality in patients with periodontal disease. Background: The purpose of this study was to identify the genetic patterns of Streptococcus mutans by DNA finger printing among caries-active, caries-free, and in children with black tooth stains. Materials and Methods: In this in vitro study Ten children with black tooth stains and ten caries-free and caries-active children between 3 and 6 years of age were recruited. 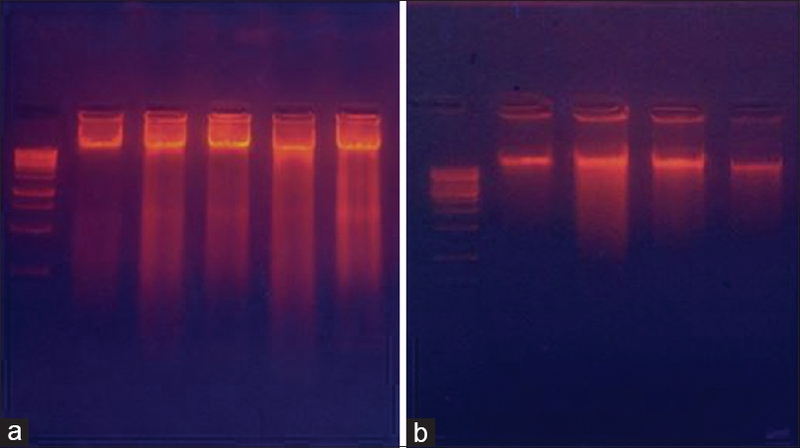 Saliva samples were collected using a sterile tube, followed by microbial culture of S. mutans, DNA isolation, and polymerase chain reaction amplification. The molecular weights of each band were converted into binary data, and data were entered into SPSS to generate similarity dendrograms. Results: Dendrogram interpretation of black tooth stain and caries-free samples revealed an identical genetic pattern in 15 samples with high genetic similarity. Dendrogram interpretation of black tooth stain and caries-active samples exhibited a greater genetic diversity. Conclusion: This study concludes that identical genotypes and high genetic similarity among isolates of the caries-free and black tooth stains. Polymorphism and genetic diversity exist between the black tooth stain and caries-active samples. Background: Dentures can be a source of infection or cross-contamination with microorganisms like Candida albicans. 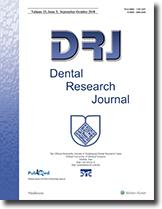 The aim of this in vitro study was to compare the effects of microwave irradiation, chemical techniques, and a mechanical method (i.e., brushing) on the disinfection of complete dentures contaminated with C. albicans. Materials and Methods: In this experimental study, sixty sterilized dentures were divided into six groups of 10 dentures each. The dentures in Groups 1 and 6 served as negative and positive controls, respectively. The dentures (Groups 2–5) were contaminated with C. albicans and subjected to four disinfection procedures: Corega tablets, 2% glutaraldehyde, brushing, and microwave irradiation. Replicate aliquots (25 mL) of the suspension were cultured in Sabouraud dextrose broth. The colonies were counted after 48 h of incubation at 37°C. To confirm long-term disinfection, the Trypticase soy broth (TSB) containers were stored at 37°C for 7 days, and turbidity was visually observed. Data were analyzed with one-way ANOVA and independent-samples t-test on SPSS the level of statistical significance was set at 0.05. Results: The dentures disinfected with microwave irradiation (650 W, 3 min) and glutaraldehyde (2%, 10 min) exhibited no evidence of fungal growth after 48 h of incubation and also no turbidity in the TSB containers after 7 days of incubation. However, the dentures disinfected using the mechanical method and Corega tablets exhibited turbidity after 7 days and fungal growth after 48 h that was significantly more than that in the two other methods (P = 0.000) and less than that in the positive control group (P = 0.000). The differences between mechanical cleaning and cleansing tablet were not significant (P = 0.017). Conclusion: Base on the results of this study, microwave irradiation (650 W, 3 min) and 2% glutaraldehyde completely disinfected the dentures contaminated with C. albicans in the short term and long term. Background: The researches regarding the influence of microthread design variables on the stress distribution in bone and a biomechanically optimal design for implant neck are limited. The aim of the present study is to compare the effect of different microthread designs on crestal bone stress. 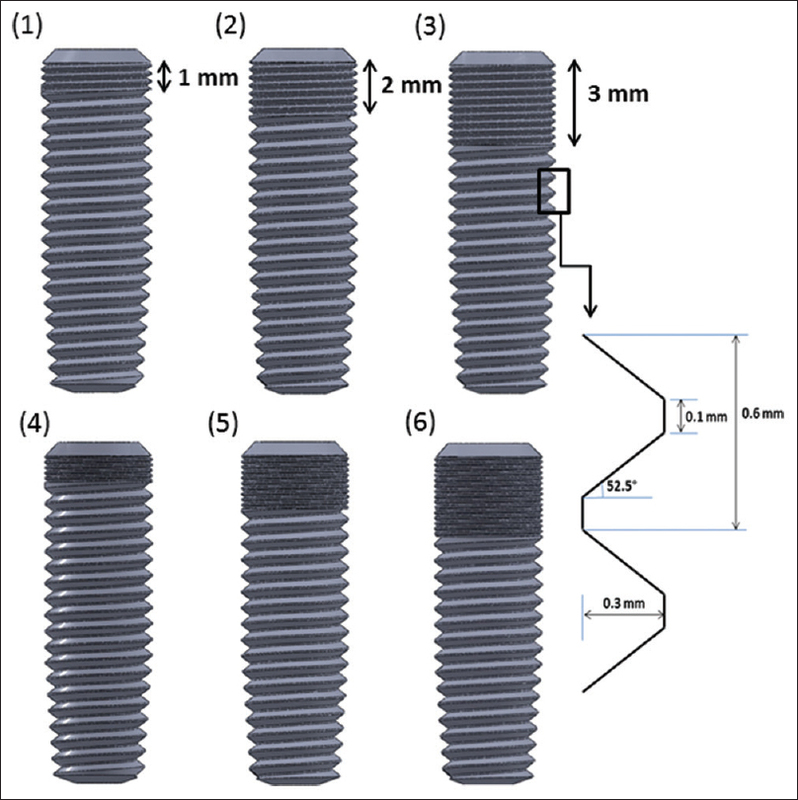 Materials and Methods: Six implant models were constructed for three-dimensional finite element analysis including two thread profile (coarse and fine) with three different lengths of microthreaded neck (1 mm, 2 mm, and 3 mm). A load of 200 N was applied in two angulations (0° and 30°) relative to the long axis of the implant and the resultant maximum von Mises equivalent (EQV), compressive, tensile, and shear stresses were measured. Results: Regardless of loading angle, the highest EQV stress was concentrated in the cortical bone around the implant model using a 1 mm neck of fine microthreads. Under axial loading, there was a negative correlation between the length of the microthreaded neck and stress level in both profiles. However, the same pattern was not observed for coarse microthreads under oblique loads. All types of measured stresses in all constructed models were increased with oblique loading. Conclusion: Peak stress levels in implant models varied with microthread profile and direction of loading. The microthread profile seemed more important than the length of the neck in reducing loading stresses exerted on the surrounding bone. Fine microthreads on a 3 mm implant neck showed consistently higher cortical bone stress than other models. Background: The heat from laser can lead to the destruction of organic components of enamel and consequently changes in the mechanical properties of enamel. The purpose of this study was to evaluate the effect of diode laser on the nanomechanical properties of enamel in the process of debonding the ceramic brackets. Materials and Methods: In This in vitro study Eighteen ceramic brackets were bonded on the intact premolars in 3 groups of 6 (one control and two study groups). To debond the brackets in the study groups, laser diode was used for 3 s with 1W and 3W power. Shear bond strength and adhesive remnant index were recorded for all groups. Hardness and elastic modulus were measured in 1–31 μ depth from enamel surface in each debonded area. Analysis of variance was used for determining the difference in shear bond strength (SBS), hardness, and elastic modulus and was followed by post hoc Tukey's honest significant difference test. One-sample t-test was used to compare the changes in the pulp temperature with the standard threshold (5.5°C). The significance level was set at %5 in this study. Results: SBS was significantly greater in the control group compared to the study groups. There was no significant difference in the average of hardness and elastic modulus of enamel between the groups. Pulp temperature elevation in the study groups was significantly < 5.5°C (P = 0.000). Conclusion: The diode laser with either 1W or 3W power for 3 s is effective in debonding the ceramic brackets without any detrimental effect on the pulp or mechanical properties of enamel. In regard to the pulp health, the 1W power laser is rather recommended for debonding the ceramic brackets than the 3W laser power. Background: CD44 is a transmembranous proteoglycan, with a main role of cell adhesion to other cells and to extracellular matrix involved in the preservation of three-dimensional structure of organs. Pleomorphic adenoma (PA) is a common benign salivary gland tumor, composed of myoepithelial and ductal components. Carcinoma ex-PA (CXPA) is malignant transformation of the epithelial elements in PA. 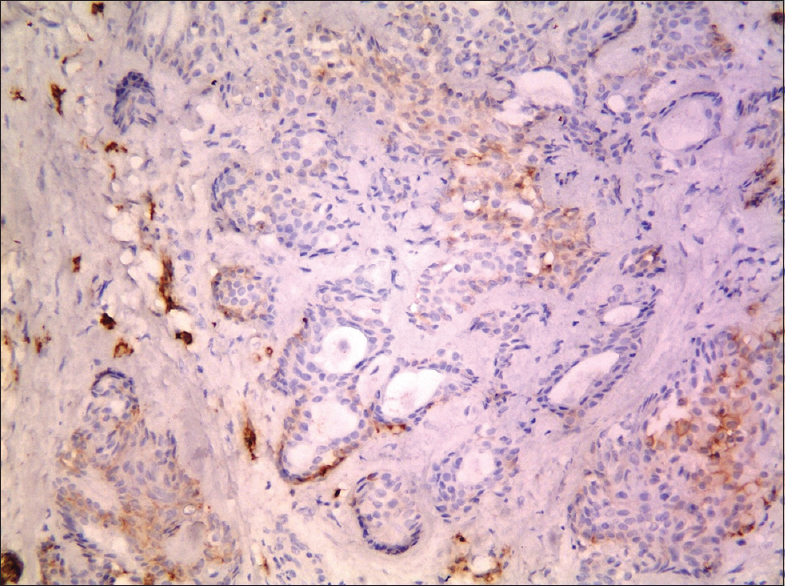 The aim of this study was to evaluate CD44 expression by immunohistochemistry in these two tumors and normal salivary gland near these tumors. Materials and Methods: In this cross-sectional immunohistochemical study, 40 paraffin blocks (formalin fixed, paraffin embedded) with thirty belonging to PA and ten blocks of CXPA and 18 paraffinized blocks of normal salivary glands' tissue adjacent to tumoral tissue (13 in the vicinity of PA and 5 in the vicinity of CXPA) were selected. Immunohistochemical expression of CD44 was observed and compared with each other. For data analysis, we used Chi-square, Kruskal–Wallis, and Mann–Whitney tests and the quantity of P values was considered 0.05. Results: There was a significant difference in CD44 expression frequency between PA, CXPA, and normal salivary glands with higher expression noted in CXPA. Furthermore, expression frequency of CD44 in adjacent normal salivary gland of CXPA was significantly higher than PA. There was no significant difference in the expression of CD44 with respect to lymph node metastasis. Conclusion: Higher expression of CD44 in CXPA might illustrate CD44's role in malignant transformation of PA.
Background: Iron supplement is recommended for alleviating iron deficiency. Black discoloration of teeth is one of the side effects of consumption of iron supplements. Besides these effects, iron drops may also act directly on the dental hard tissues, with erosive lesions as possible outcomes of their content. In this regard, we decided to compare iron absorption of five types of iron drops in enamel and determine its relationship with pH and titrable acidity (TA) of them. 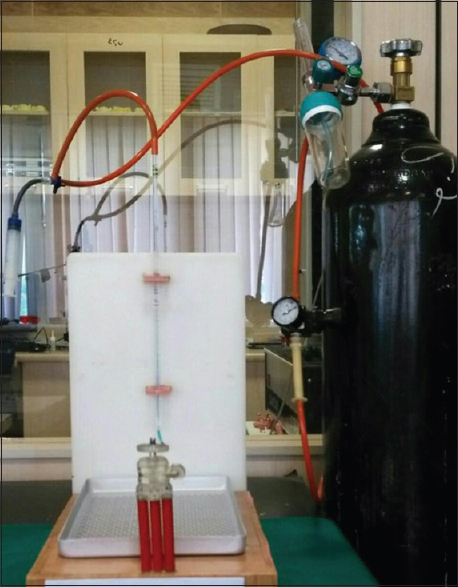 Materials and Methods: In this in-vitro study The pH of 5 kinds of iron was measured by a digital pH meter. Each drop was titrated and then the TA was calculated. For this experimental study, 40 healthy anterior primary teeth were prepared and divided into 5 groups then exposed to iron drops. The level of iron absorption was determined by atomic absorption. The Pearson correlation test was used to analysis correlations between pH, TA, and absorption of iron ions in the anterior primary teeth. One-way ANOVA was used for statistical analysis. Statistical significance was set at P < 0.05. Results: The mean of pH in Kharazmi drops was significantly less than both Irovit, and FerroKids drops (P < 0.05) but did not differ significantly with other drops. Kharazmi drops TA was higher than all drops (P < 0.05). There was no significant difference between the mean iron ion adsorption, as well as between iron ion absorption with pH and TA also not found a statistically significant relationship. Conclusion: All drops have acidic content that increases their potential for erosion. Reducing the potential of the effects of iron drops on dental hard tissues should be of concern to all health professionals. Nonsyndromic unilateral permanent canine agenesis, particularly in the lower jaw, is an infrequent clinical observation that has occasionally been reported in the scientific literature. The main aim of the present case report and study is to give insights into the clinical features and genetic information of a nonsyndromic patient affected by unilateral lower canine agenesis and her relatives. 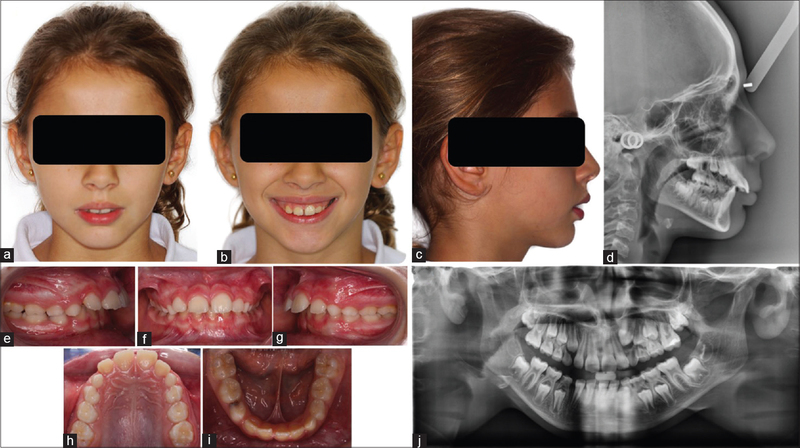 A young girl of 9-year-old with a Class II skeletal malocclusion, sella turcica bridging, and severe overjet but no other dental anomalies is described. No associations were found with other types of dental agenesis and previously described genetic variations of the CTNNB1 gene. The possibility of a novel genetic locus should be considered as a possible genetic etiology for this extremely rare condition in a nonsyndromic patient. Based on scientific literature written in English, the present clinical case is one of the first reports to describe a nonsyndromic permanent unilateral mandibular canine agenesis.